PONY CANYON INC. is well-known for eels as the company produced Sukkie’s singer debut in Japan. Today it is announced that PONY CANYON has obtained the broadcast right of “Love Rain” in Japan and they have paid the toppest dollar for it since Korean dramas started to be broadcast in Japan. The airdate hasn’t been decided yet. A more complete, though short, overview of “You’re my Pet” greeting sessions, which seem to be full of fun and laughter. And JKS is a sport for demonstrating how he gets shot! And after watching the movie, the minority male viewers also have positive comments about it. YMP fighting!! [Pics&Video] JKS & KHN appear at cinemas to offer greetings! Read more[Pics&Video] JKS & KHN appear at cinemas to offer greetings! Movie “You’re my Pet” (YMP) has just shown in cinemas on 10 Nov but its pirated video is already circulating fast on the internet., including video clips of JKS and the OSTs he sang in the movie. The movie will air in Japan next year, and the pirated videos infringe on the rights of the consumer. YMP is adapted from Japanese manga and narrates the amazing cohabitation story of a domineering woman Ji-eun, who has beauty, figure and capability but does not know love, and her pretty-boy pet Kang In-ho (JKS). For eels, and if you care about JKS, please do not upload or circulate any of JKS’ official works in the initial and important period when it is first launched, in particular, the movie “You’re my Pet” and also “Budapest Diary”. Please do not share Youtube or other website links etc etc. We should show by our action that we support JKS, either by watching his movie in the cinema or buying his official products. For most of us not in Japan, Korea or China (midst of negotiations for airing schedule), let’s wait patiently for the official DVD. Let us respect the copyright laws and protect the interests of JKS. Thanks! I finally found the YMP app for iPhone and iPad. I heard it was released several days ago, but I couldn’t find it. But I did it! So I’ll show you how to reach the app. Heard that a fan was refused autograph today, reason being that JKS was not feeling well… hope he rests well and recover soon …. On 2 Nov afternoon, “You’re my Pet” (YMP) press conference was held. The leads Kim Ha-neul and Jang Keun Suk and director Kim Byung-kun attended. 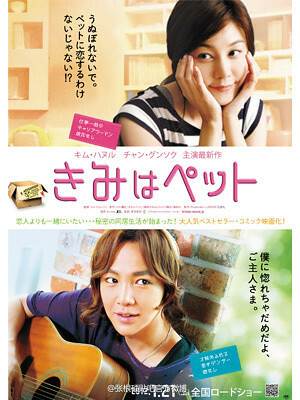 In the romantic comedy adapted from Japanese manga, Kim Ha-neul acts as Chi-eun and JKS acts as coquettish and absolutely faithful pet In-ho. Based on the novel by Japanese author Yayoi Ogawa, the plot has already been affirmed. The movie describes the meeting, mutual understanding and friendship between owner and pet – the socially passive Chi-eun and popular and talented classical ballet In-ho. YMP airs in Japan from 21 Jan 2012.